Here's my NEW and IMPROVED Christmas SINGO! Complete with 25 Singo sheets and 3 Calling Card pages! We will be playing Singo the Sunday after Christmas. It's a fun, low-key game that involves lots of singing, movement and is SUPER easy. Did I mention it's also fun? Do your presidency a favor and offer to take the whole time so they don't have to plan a lesson as this will take more than 20 minutes to finish (Merry Christmas, right?). If you can't get the whole time, omit (or VERY quickly discuss) the symbols and move on. Or, even better have it run for 2 weeks!! 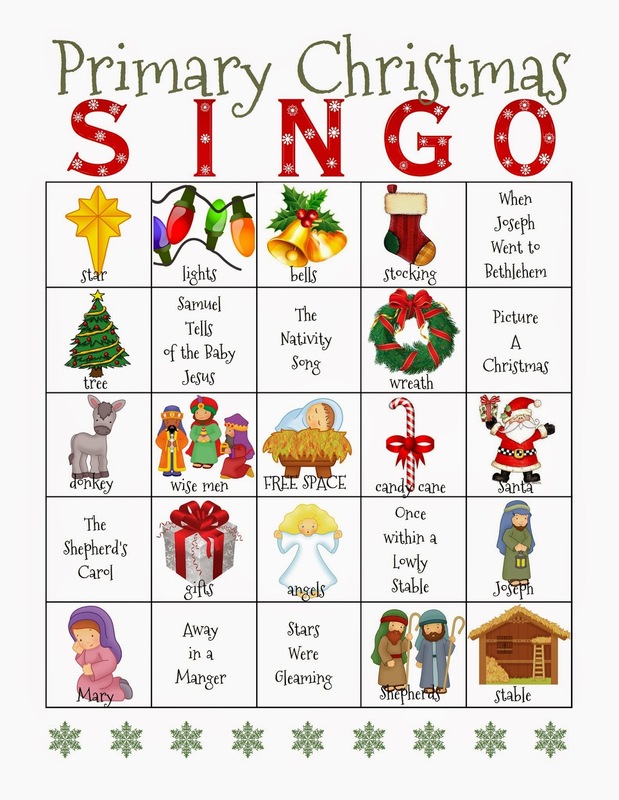 Find the 25 Singo sheets HERE. I printed mine on white card stock and placed in sheet protectors. I prefer sheet protectors for these over laminating because it's cheaper AND I put 25 green squares of construction paper as my markers in each pocket. If you don't want to cut that many squares, I'd recommend bringing in the Christmas M&M's and the kids can eat them after you are finished playing! Download them HERE (something is wrong with Google Viewer for this document and I can't figure it out. But, if you download the actual document to your computer, there should be 3 pages and you can print it from there). I've also uploaded another copy of this document HERE in case it works better than the previous link. Star: The star was fulfillment of the promise that a new star would arise on the night of Christ's birth. 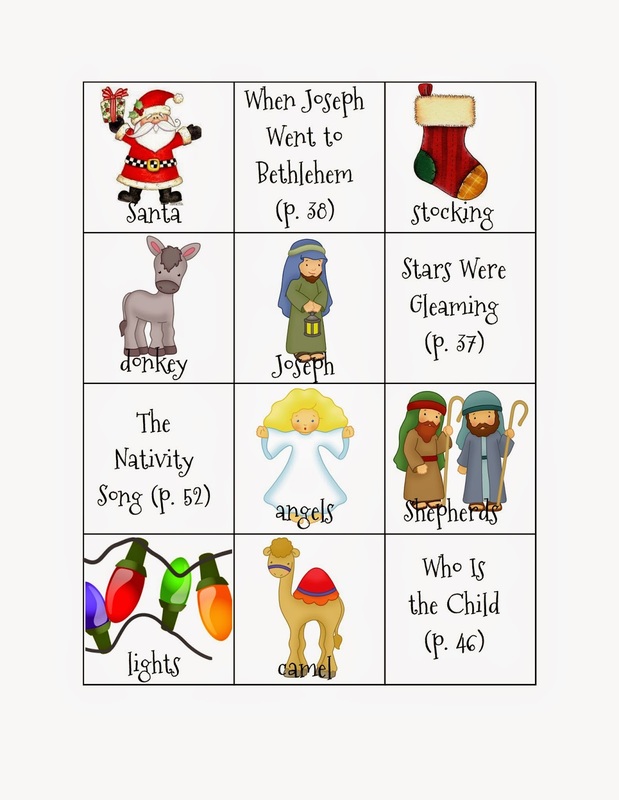 The people of the Book of Mormon also saw the star, as well as the Wise Men that came from the East. Candy Cane: "the candy cane is widely recognized as a reproduction of a shepherd's staff." (Bruce D. Porter "King of Kings") The crook on the staff helps to bring back sheep that have strayed. 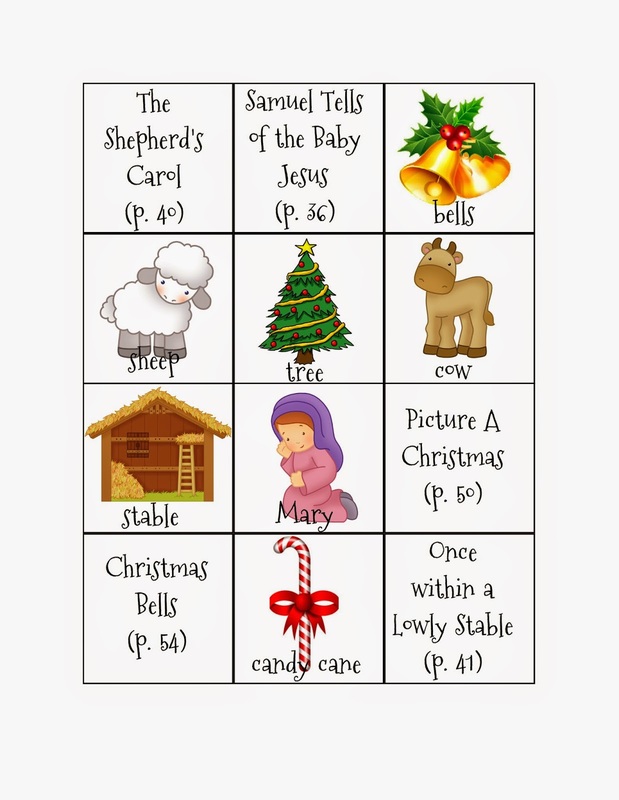 the candy cane is the symbol of Christ being our shepherd. Christmas Wreath: "The Christmas wreath originated in remembrance of the crown of thorns worn by the Savior on the cross; it may also remind us that God's plan is "one eternal round." (Bruce D. Porter "King of Kings")" The wreath symbolizes eternity and the eternal nature of Christ's love. it is a circle, without beginning and without end." Tree Lights: Remind us that Christ is the light of the world. Gifts: We give and receive gifts at Christmas time in remembrance of Heavenly Father's greatest gift of all: His son Jesus Christ. Christmas Tree: The green color of the evergreen tree remains green all year round. our Christmas trees represent eternal life - the greatest gift from our Savior. The needles point heavenward, reminding us of Christ. I then laminated the calling cards and placed them in a small bag. 1. Hand a sheet to each child and everyone competes against each other. I'd recommend this variation for Senior Primary ONLY. Have them turn around and place their sheet on their chair and they kneel on the floor. Then, when it's time to sing, everyone turns around and stands up. It provides some great movement. 2. Give each class a sheet and everyone can gather around their teacher and play against classes. This is great for larger primaries and young kids. Again, everyone can turn around to face the front when you sing. 3. Print off one or two Singo sheets as large poster sizes either at Costco OR I "tiled" 2 of the Singo sheets so each will print on 6 pages. You can then piece them together on the chalkboard. Download sheet 1 HERE and sheet 2 HERE (again, something is wrong with Google Viewer so just download the items to your computer and all the pages should be there). Use more magnets as your markers (or use the calling cards to cover matches) and have the primary just fill in the singo chart if only using one chart. Kids can come up and draw a calling card out of the bag. If you print off two, the primary can compete against the teachers or boys, vs. girls, etc. Note that if you only use 1 or 2 sheets, there may be calling cards that you will not be using so make sure to remove them! No matter your variation, how you play is the same: pull out a calling card and everyone who has that same item on their Singo sheet covers it with their marker (not all items are on each sheet). If a song is pulled - sing it! I'd recomment posting words to all the songs (see how I do that HERE). If a symbol is pulled - briefly discuss its meaning. The middle is a "FREE SPACE" and everyone gets to cover that one when you begin. When someone reaches 5 in a row, they call out "SINGO!" and you can figure out some sort of reward. You can bring silly hats for their teacher to wear, a treat, Christmas stickers, etc. I've gove a few more ideas HERE. They can then go for blackout. If you use M&M's as your markers, they can eat them once their sheet is full. I hope you enjoy these! They are a great annual game to pull out at Christmas every year! If you need a few more pages, leave a comment and maybe I can put a FEW more together :). And also just want to thank everyone for enjoying my material. This website has become a really fun hobby for me. All the kind comments everyone has to say make it TOTALLY worth my while. So I'll be seeing y'all next year with LOTS more lesson plans and posts! Here's to another great year! Thank you!! These are so cute! Such a fun idea! Thank you so much for all your hard work each week. It helps me out so much! You are amazing!! Thanks a bunch!! DEFINITELY using these tomorrow!! did you try just copying the image of the calling cards and saving it on your word processer? sweet. that worked. thank you very much!!! This is wonderful! 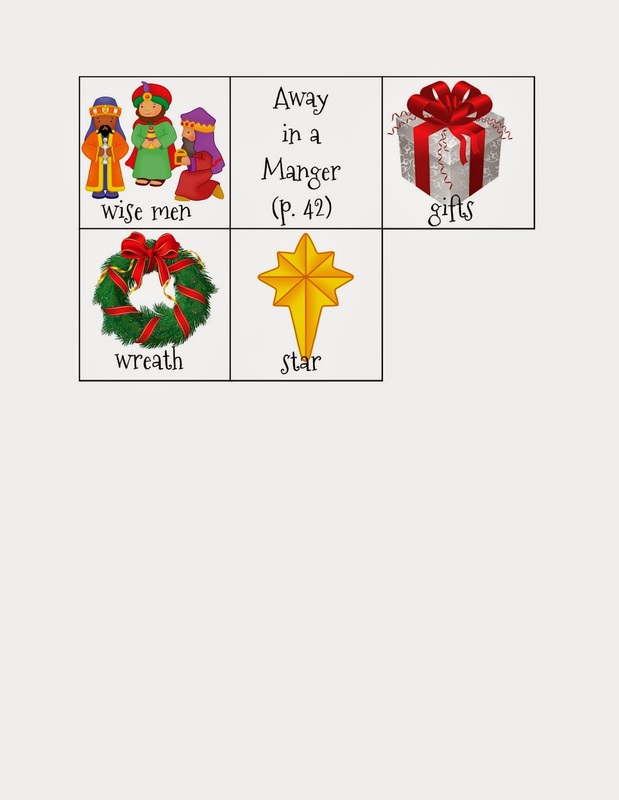 Using in primary and at my family christmas party! I've been the primary chorister for over a year now and it's amazing ideas like this that not only get me through singing time, but make me love my calling. It's been SO good for me. THANK YOU for your creativity and willingness to share your ideas. It's so appreciated! Merry Christmas! You are a rockstar! This is incredible work! I'm truly thankful for your blog! This is so awesome!! Thank you so much for sharing your talent and hard work and time! You are such a great example and so much help to so many of us choristers i'm sure! Can't thank you enough! Merry Christmas! seriously this is THE BEST!!!!! THANK YOU SO MUCH!!!! My primary children will be thrilled with this activity. Thank you so much for the generous gift. We ministry to low income children and will use this at our Christmas party! Can't wait to do this this year! Thank you SO much for putting it all together!! Thank you! This looks like so much fun! I love the ideas you come up with, and that you are willing to share them with us. Your blog has saved me as a newly-called primary chorister. Being able to use your schedule and ideas has been the biggest tender mercy. Thank you thank you thank you for taking time to post all that you do and to make it shareable!! I'm so grateful for your kindness in sharing SINGO. I am using it for singing time tomorrow. Thanks and Merry Christmas! Thanks Camille, you are amazing! So good of you to share all your ideas and creativity! Merry Christmas! Camille, this is my 5th "tour of duty" as Primary chorister. I am also 60 years old. I am grateful for your blog as i still love the kids but don't want to think up new ideas every week. Why reinvent the wheel? so, thank you, thank you! All I do is buy new color cartridges!! This is my second week as Primary Chorister...I was terrified when I got this calling! Thank you for this amazing resource for those of us (ME) that are not quite as creative and don't want to reinvent the wheel!! Thanks Camille. This saved my rear end for tomorrow. I had back surgery earlier in the year and I'm flaring right now and had no idea or energy of what to do. Thank you! Thank you for sharing all your great ideas. I used the Singo game today and didn't notice until the kids pulled the cards, but there are pictures in the calling cards that are not on the game board 1. I printed it to use as a whole primary. Just thought I'd mention to others who might use one game board for the whole group that there are some symbols that you might not need! I will definitely be using this!!! Thanks soooooo much for all you do to share with so many of us! Grateful beyond words!!! Thank you I can't wait to try this! I know my primary kids will absolutely love it! This is awesome Do you happen to have it in word. My printer stuggles with doing PDF files I have an old HP jet printer! I don't have them in Word - I created them in a different software. Sorry I'm not more help! You could probably download each PDF, export it as a JPEG file then open a word document and insert the JPEG file. Sorry I'm not more help. do they have to get a row or a line or a cross to win? or if they get 5 blocks then they win? To get a Singo, they need 5 in a row. That row can be across, vertical or at a slant. When my kids get a singo, I pass out a sticker. I hope that makes sense. Is there a way to make them smaller? I have a really big primary and I'd love to try and get 2 to a page. You could export each PDF as a jpeg image then insert into a Word doc (landscape) and size the images to fit 2 to a page, adjusting margins. Hope that helps some. Thank you for making this cute activity! If my primary is over 25 would you just duplicate some of the SINGO sheets? I'd either duplicate some or partner up so there are 2 kids per one sheet. All of your ideas and plans are sooo helpful to this new Primary Chorister! You are amazing and I hope you keep the great ideas coming! Thanks for all the great ideas! I love them. I used this today and it was such a hit! What program did you use to make it? I'd love to make one for Pioneer Day next summer. Thanks! I made these a few years ago with a simple scrapbooking software. Now I create everything in Photoshop. But I LOVE your idea of doing one for Pioneer Day! I'm going to file that idea away and make one in July! Thanks for the tip!! I did this yesterday and the kids loved it. Thank you so much for being so generous with your wonderful ideas! This is my 3rd time serving as chorister (after a 7 year break) and your site has helped me get back in the swing of things. Have a wonderful Christmas! Thank you so much!!! My goodness all the work you've done is incredible. This has nothing to do with Singo but this is the post I’m reading today so I thought I would just comment on here. I did it. I bought bells and took them to primary and....it was a huge hit! Thank you for your detailed posts and all the material you post here. It gives me the courage to try new things! I know the bells aren't for everyone and every primary but I LOVE them and am happy to hear when someone else feels the same! I've made a Bingo before and it is SOOOO TIME CONSUMING! Sure glad this one is done! THANKS SO MUCH. That warms my heart that these are being used in China! These ARE a lot of work to create so I'm happy to be able to share what I've made! And what a great way to share a little bit of the gospel :). Thank you for commenting!! So excited to use these this year! Thanks so much for creating them. It's adorable.